FLASH GIVEAWAY! ENDED – THANKS FOR ENTERING! I have 4 vouchers for a FREE photo book from Photobook Canada and 1 from Photobook America. Each is for a 20-page, 11×8.5 Medium Landscape Imagewrap Lite (shipping not included) Voucher expires Feb 28, 2014. The Canadian ones are only for delivery within Canada and is valued at CAD43 and the U.S. one is only for delivery in the U.S. and is valued at USD43. They are up for grabs! The first 4 Canadians and first U.S. reader who comment on this post below will get a voucher. Be sure to tell me if you’re in the U.S. or Canada. For Canadians, I will ask you a skill question to comply with local requirements. (Don’t worry it will be easy). Giveaway will close when I get my 4 Canadian and 1 U.S. reader confirmed or by October 2, 2013 11:59pm CST, whichever is sooner. Your comment might not post right away, but it will be time stamped so don’t worry it will count if you comment in time and if you are eligible. Thanks to Photobook Worldwide for sponsoring the prizes! Recently I received a comment on my Facebook fan page from AJ about sharing some tips for non-writers on how to include narrative in your photo books. I’m sure you have plenty on your “to do” list but what about the Words? Journaling? There are probably articles out there on other scrapbooking sites but I can’t find any (good ones). I’m working on my childhood book and want to include lots of memories and such. Tips on how to write (for us non-writers) when we’re not looking to write a novel but do want more then dates and two sentence captions. Honestly, I don’t know if I should even venture into this topic. Sometimes I think a post topic is going to be easy and then I get into it and I find it’s not as simple as I thought. But, I suppose I could dig deep into the past and brush the cobwebs off that degree I earned many, many years ago in journalism. Yes, I was a broadcasting major in college. As you may be able to tell from my writing style, my degree in broadcasting has influenced the way I write for this blog. I prefer a casual, conversational tone, and many times I purposely do not use proper grammar. Sometimes proper grammar sounds wrong or “too proper”. I hope you’re not grading me! Now that I’ve shared that tidbit, I bet you’re expecting some morsels of scholarly greatness aren’t you? Well, I can’t promise that, but I’ll do my best! 3) Interview Others. Don’t feel like you have to put the whole narrative on your shoulders. 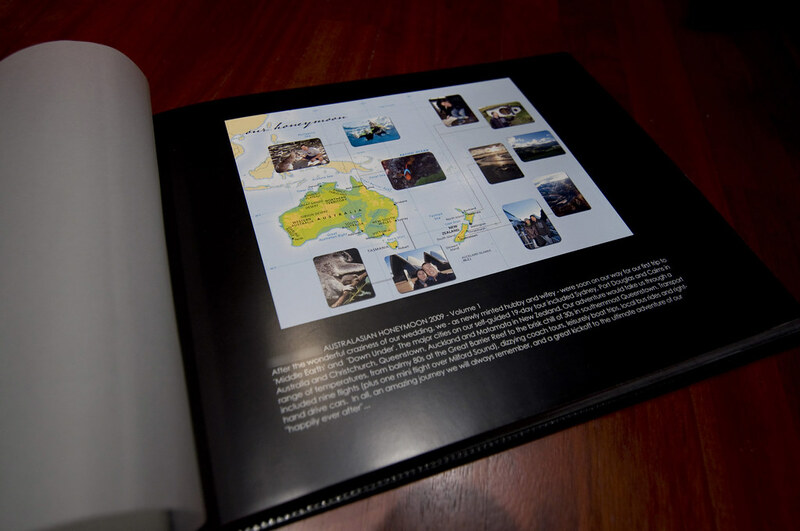 For example if your photo book is about a vacation, come up with a list of fun questions to ask each traveler such as, “What was your favorite place we visited on this trip? What was your favorite meal? What was a surprising thing you learned?” I think it would be a great way to remember the trip and to get the different perspectives of each individual. The reader who requested this post is doing a childhood book. While her personal thoughts should be front and center, perhaps interviewing her mother, father, siblings, family friends about what memories a particular photo brings to mind would be an interesting exercise. Be sure to answer the same questions yourself! 6) Infographics. I love, love, love infographics. You may not be familiar with this term, but I’m sure you’ve seen them before. An infographic is a creative, visual method of conveying information. My version of the infographic is a lot less sophisticated than some of the examples I’ve seen, but I’m always game to give something a try. For example, we recently came back from Disneyland. I’m so excited to make photo books (yes I did mean to use plural) of this trip. One thing I wanted to do was an account of the specific attractions we experienced and the places we ate. While I could type up a list and put that in the book as a caption, that’s a little to blah for me. What I plan to do is scan the park map and then circle or use a color overlay to highlight each ride we went on. I may even put a small inset photo of us on that ride or in front of the ride to make it even more personal. I used this same concept for my honeymoon book. I created a map of the places we visited and then added my favorite photo of us in each place. We also used the same map in our wedding thank you cards. They were a big hit with our friends and family. I’ve also seen folks create fun ways to display facts about their year or their trip such as how many miles they traveled, how many hamburgers they ate, etc. 7) Make Your Own Font. There are some free services as well as paid ones that are very affordable for having a font made of your own handwriting. How cool is that to have your own font? I made one of my printing and I have used it a couple times in books. Lends a nice personal touch. If you’re interested I’ll write more on that later. Make sure to have someone read over your narrative to check for errors. It’s so annoying to find a typo after a book has gone to print. Take a look at my pre-printing checklist here. Now that you have some tips on what to write, check out my design tips for laying out text. Happy Photobooking! Don’t forget to enter your comment for to be eligible for the giveaway! Sweet! I could really use these to make books from our recent visit to Disney!!! Hi Photobook Girl! I would like to enter! I am a US resident. I don’t think I’ve ever used text in a photo book. Maybe I should start. You had a lot of great ideas! I do journal in my photo books. Coming from a Creative Memories background, I got a lot of training on how the words are just as important as the pictures. But I’m not afraid of blank space. If I only have a little bit to say, I don’t try to fill the blank space beyond what I have to communicate. I would love a free photo book from Photobook America! I’m in the US and would make my cousin a wedding photo book. Forgot to say that I’m in the USA. I could always use a good photo book coupon. I look to photobook girl for the best deals whenever I have one to make. I would love this! I’m in the US. I’m a US reader. Love your site! I recommend it all the time to friends who ask about photo books. I’m Canadian and would love to win a book!!! Thanks for the tips, i especially like the song lyrics and quotes idea! Would love a Photobook america book for new baby on the way! Where are the free programs to make your own fonts? So I’m in the U.S.
thanks – lotsa great tips! Keeping a journal is what came to my mind the instant I saw your title & then when I saw it on the top of the list, I was overjoyed!! My husband & I are planning on a trip this weekend by the sea & the first thing I thought of getting ready was a travel journal for the journey! I’ve also mad a note to collect scraps (tickets/napkins/labels etc) from each place we visit! I live in India as of now, but my family is in Indianapolis. Would I qualify for the US voucher?! Hey Photobook Girl – Thanks for the wonderful information and coupon access. It is hugely appreciated by your loyal fans! i love photobook canada and they are my go to publisher for photobooks! I only caption photos that either have a specific memory attached to them or a specific place. I’ll especially write a caption if I won’t remember something cute my kids said or did. We love going to Disney and look forward to taking our grandchildren. A photo book will be a must after that. Hi! I’m from the U.S. and would love the free photobook! Traditional journaling has always been a challenge for me (have tried many times), however “image journaling” (including photos and drawings) add a new dimension to my travels and everyday experiences – I am always involved in the creation of some sort of photobook. I love the infographic suggestion! I’ll have to try that. The font one is great too, but I’m not crazy about my own handwriting! Serious–I’m first? I love your tips, always! And I’m in the US, LOL! I’m in the US. Love photo books and need to make another for my fiancé! Oh and I loved your tips. I think I do a fairly good job on narrative, but I think i’ll incorporate the interviewing, inforgraphics, and the personalized font in my next book…which I need to get going on! Any deals on Blurb? You give me inspiration on finally doing something with the thousands of pictures I have. Please pick me…..
Love the idea of the info graphic! would love more details on how you do that? maybe a whole post on it? I’m in Canada but honestly, I’m so behind on photobooks I probably shouldn’t take the coupon from a less-procrastinater-y photobook maker. I previously commented. I’m in the us. Journaling is a must, otherwise you miss out on the little things that make you laugh. Even as the creator of the books, years later, I can’t remember everything. When I read my journal comments, it brings me back in time to why I took the picture in the first place. Im a Canadian Photobookgirl fan!! Awesome chance for a great prize! Us reader- would love to win a photo book to use for our recent vacation! Yay for photo books! Thanks for the great journaling tips. This Canadian reader is grateful. I liked all your tips. I usually did the book by date and give it some caption on each days. If it all just one day then i will caption on what kind of activity they do. I try to be funny sometime because later when they read it back it will remind them of a good time. I once came back from a quick weekend trip with some lackluster photos, but a great story about drunken neighbors. I wrote the story out and then arranged photos from my trip to fit the story. For example: “The drunk neighbor chased me all the way from the bathrooms to my parked car…” This caption went onto the page next to a picture of my 3 year playing in the bathtub and another picture of my kid pretending to drive my car. I continued the story in this fashion: telling my story with captions underneath innocent pictures from my trip. It is one of my favorite books. I’m in for the giveaway albums for Canadian Customer. Always nice to read your article BTW ! Great idea. Thank you for your vigilance in keeping us informed. What I’ve found I do is make my layout and email it to the family. then sometimes in the email I’ll put the funny sidestory that goes with the layout. I realize I need to be including that in the layout as well!